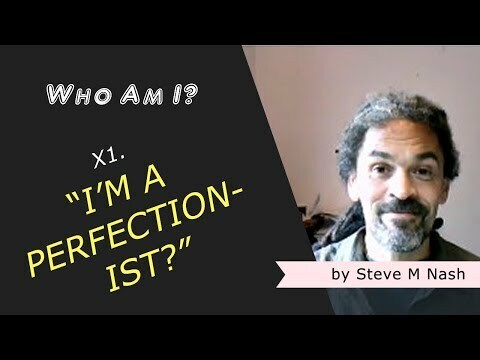 I Like Doing Things 'Right' (Perfectionist) | Who Am I? Xtra 1. I like doing things ‘right’ (I’m a perfectionist). Hah, there would be many, many folks that know me that would think I am the last person on earth who’d be a perfectionist. My car is old and dented. My clothes all have holes in them (and not expensive ‘designer holes’). OMG, I’m a bloomin’ perfectionist type too! I like that actually, because it becomes more and more plain to see to me, that the planet is ‘awash’ with (human) energies. Energies like anger, frustration, joy, confusion and even perfectionism. And everyone gets to try on some or all of these energies for size. Then some of us take a fancy for a particular form of energy, start to hold onto it, start to identify with it. Nevertheless, these energies ARE impersonal. They are not who you are. Introducing a series of videos that explore my so-called 'personality' by way of looking at qualities, behaviours and traits that I seem to identify with. Why? To get curious. To get curious about who I am - by looking at who I am not. That's why. It's all explained here... Who Am I? Hi, my name's Steve and I could worry for England - once! Analysing, angst and anxiety were typical, and enjoying, appeciating and relaxing were not. These. Are. Just. Words. Well-articulated, maybe, or confusing, or ‘clever’. Still. Just words. Not the 3 Principles. Not love. Not humanity. Just words, just trying their best to point you (to the feeling) ‘within’.